Clustered Regularly Interspaced Short Palindromic Repeat (CRISPR) sequences have been identified in many prokaryotic species. CRISPR loci occur on prokaryotic chromosomal DNA and are characterized by having repeated identical palindromic segments (repeats) that are 21-40 base pairs (bp) in length (Mojica et al. 2000; Jansen et al. 2002). The CRISPR repeat sequences vary among species. Repeats from closely related species are usually more similar than repeats from distantly related species (Mojica et al. 2000; Jansen et al. 2002). The repeat sequences are not directly adjacent: spacer sequences (protospacers) ranging from 20-58 bp in length separate each repeat sequence on a CRISPR locus (Mojica et al. 2000). Nearly all of the protospacers at a CRISPR locus are unique, with each spacer occurring only once at a given CRISPR locus. The spacers for a given species do not match spacers found in other species (Jansen et al. 2002). The number of repeat/protospacer alternations per locus varies. Some loci contain only two repeats and two protospacers, while other loci contain over 120 repeats and 120 protospacers (Mojica et al. 2000; Jansen et al. 2002). Most prokaryotic species have only one CRISPR locus (Jansen et al. 2002), but some species contain up to eight CRISPR loci (Mojica et al. 2000). Jansen and colleagues determined that in most species with multiple loci, the repeats at the different loci match closely or perfectly. However, the researchers also identified exceptions, such as Streptococcus pyrogenes, which has multiple CRISPR loci each with different repeat units. In 2002, Jansen and colleagues discovered a group of CRISPR-associated (Cas) genes. 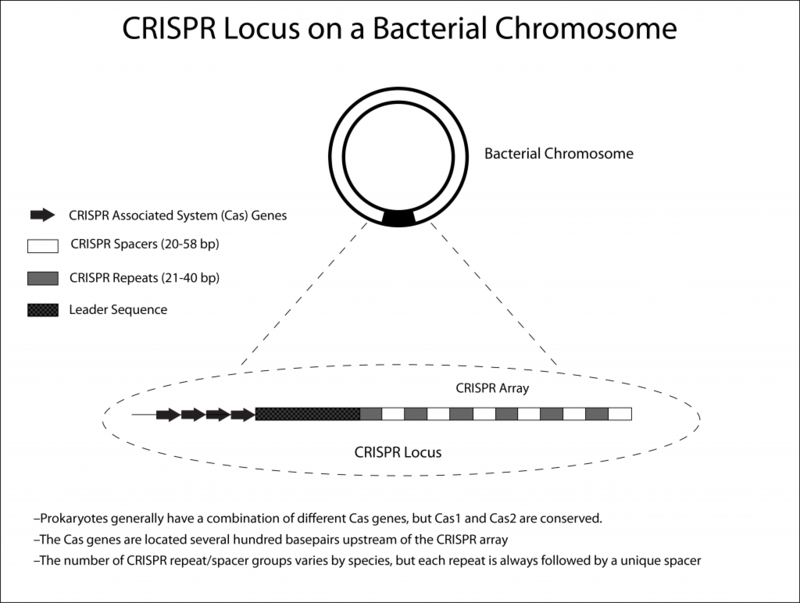 The group hypothesized, based on sequence homology, that these genes coded proteins that would bind and manipulate the DNA at the CRISPR locus. However, the exact purpose of CRISPR loci and Cas genes still remained unknown (Jansen et al. 2002). In 2005, Mojica et al. and Bolotin et al. performed bioinformatics experiments and determined that most protospacer sequences found in CRISPR arrays are closely related to DNA found in prophage and conjugative plasmids (Mojica et al. 2005; Bolotin et al. 2005). Mojica and colleagues also observed that “Most targeted genes detected in this study are directly involved in plasmid transference, DNA replication, virion assembly, DNA protection against restriction, replicon partitioning, pili synthesis, replicons resolution, transposition, or phage integration and excision” (Mojica et al. 2005). They argued that each of these systems is necessary for phage infection, and they therefore concluded that CRISPR/Cas may act as a prokaryotic immune system (Mojica et al. 2005). Bolotin and colleagues used data from a previous study on phage resistance in S. thermophilus strains (Fayard, 1993) and determined that the strains with greater phage resistance also had a greater number of protospacers located on the CRISPR locus (Bolotin et al. 2005). The group reached the same conclusion as Mojica et al., that CRISPR/Cas may act as a prokaryotic immune system. I’m writing a paper on CRISPR, and out of all my research, you all have the best figures I’ve seen! Thanks! Biologically ( not the utility aspect of editing), when the spacer element is transcribed to make a pre-crRNA and them processed, what stops endogenous bacterial Cas9 from cleaving the spacer sequence withing the crisper cluster after the crRNA associates with the tracrRNA ? the crRNA would be 100 % complimentary to one strand of the spacer so it should cut, no ? is it because of the lack of a PAM sites within crispr cluster ? If so, if you were to introduce a PAM site without affecting the ability of the tracrRNA to bind, wouldn’t this form of adaptive immunity be a doubled edged sword ?